It’s hard not to love panda bears. Ever since I was pretty little, I was always partial to those bandit-eyed fluffy bamboo eaters. Over the years, though, pandas have become increasingly more endangered, and many people have devoted their lives to ensuring their survival. 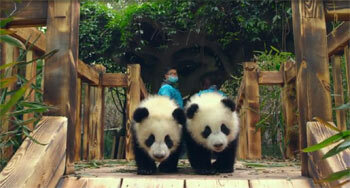 Pandas is a documentary that very lightly touches on these lovable animals. For having such a broad title, I was rather surprised to find how small and specific the subject matter ended up being. The story opens up by giving us a little history as to what a certain group of panda caretakers does, and at first gives off the impression we’ll be following the lives of three or four panda cubs into adulthood. However, we quickly discover that of the four cubs, only one is selected for raising to be released into the wild. The documentary moves at a crawling pace at times, lingering when it needs to, but then breezes over long sections of time. It feels like an abbreviated series of videos that leaves out some potentially more interesting anecdotes. Pandas is much more about a group of humans trying to raise one panda, named Qian Qian, to be released into the wild, than it is about panda bears themselves. And because of that, the film’s title and marketing seem a bit misleading. The content of the film is very mild, given that it’s rated G, for “all audiences.” However, there’s a hint of mild (and unintentionally offensive) blasphemy, in the form of some exclamations from the scientists handling the pandas. At one point, Qian Qian climbs all over the scientist, Jake, and he comments on her weight with a use of “Oh my G-d” and what sounded like a muffled use of Jesus’ name in vain. The only other content worth noting is when a panda is injured, we briefly see a close-up of its paw which appears to have some kind of gash in it. It’s not gory, but some sensitive viewers might have a problem with it. I was kind of looking forward to Pandas and the fun that could be had to follow along with these beloved black and white bears, but I found the journey more lackluster and less engaging than I’d hoped. It does have several moments of “cuteness overload” but it’s not quite enough to bring the whole production up. If you are partial to animal documentaries, this one is probably quite adequate, but if documentaries aren’t really your thing — even if you love panda bears — then I suggest passing on Pandas. I believe, right now, the only way to get Pandas is through digital providers, like Amazon, iTunes, VUDU, and GooglePlay. It is available in 4K, but while it does look crisp and impressive at times, I don’t think streaming 4K is quite as good as disc-based 4K. At any rate, I had used VUDU to stream it in UHD on my TV, but it offers no digital extras. The iTunes digital copy has the following, lone featurette:Making Pandas (2:46) – This featurette focuses on the story of Pandas and how Qian Qian is the first panda to be part of this new, groundbreaking plan to raise pandas and release them into the wild. 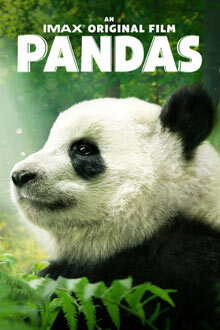 Actress Kristen Bell, who narrates Pandas, talks about the story here. 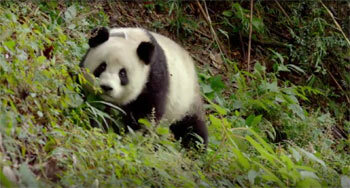 Finally, this short video concludes with them talking about the IMAX presentation for Pandas. Blood/Gore: We briefly see part of a bite wound on Qian Qian’s paw. Violence: After Qian Qian is released to the wild, they find that her monitor showed 24 hrs of not moving. They set out for 2 days to try to find her, and when they did, we see her up in a tree listless from being injured and dehydrated. It took them 5 days, but they were able to coax her down.